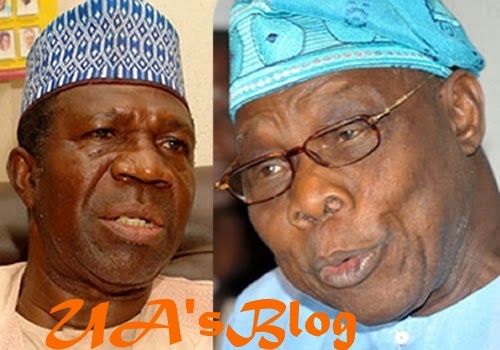 Former Senate President, Ameh Ebute has asked former President Olusegun Obasanjo to show remorse for the crises bedevilling the nation rather than dissipate energy on writing memos capacle of causing disaffection in the polity. The former Senate President in a letter addressed to Chief Obasanjo title, “Re: The Way Out: A Clarion Call For Coaliation For Nigeria Movement”, advised the former leader to toll the path of statesmanship by thinking of solutions to help solve the problems he created in his eight years of his Presidency. The former Senator who briefed journalists in Abuja on Tuesday on the content of his letter said he had cautioned Obasanjo when he wrote former President Jonathan in a similar letter that it was not in the interest of the unity and peace of the nation as it is an affront on decency and decorous behavior by publicly attempting to ridicule, malign and assault the seat of power with a repeat letter to President Buhari. “In the current instance too, you have reeled out a torrent of subsisting problems and perceived deficiencies of the Buhari Presidency very hypocritically and in utmost contempt for the office and personality of President Buhari. It is all in veiled pursuit of your secret agenda for the absolute ruination and destruction of Nigeria, a foundation faultily laid by you between 1999 and 2007, when you served as President of the country”. “The issues of poverty, insecurity, poor economic management as trumpeted in your letter have existed with Nigeria and aggravated under your reign as President. Precisely, poverty, hunger and disease are cardinal components of the Millennium Development Goals, (MDGs), which you claim to be spearheading efforts in the guise of “Zero Hunger” initiative; but gave no attention to it when you wielded power at Aso Rock. This is the pretence and deception that have become your trademark and uprooted or alienated you from Nigerians”. In spite of the unconvincing excuse, I proceeded to advice that a former President genuinely interested in the peace, unity and progress of his country does not toe such path, which diminishes his self-esteem, dignity and character. I erroneously thought you would harken to my counsel. But today, I am proved wrong, as you have again trampled on decency and decorous behavior by publicly attempting to ridicule, malign and assault the seat of power with a repeat letter to President Buhari. In truthfulness, would you again claim President Buhari ignored your secret/private letters to him which has necessitated the public interrogation of issues of governance and leadership under the Buhari Presidency? The answer is certainly no! And this posturing has finally erased the tiniest modicum of respect and trust in you from Nigerians. Each time you embark on your voyage of self-destruction, you endlessly adumbrate on pervading unresolved national problems, you created and nurtured to fester. The issues of poverty, insecurity, poor economic management as trumpeted in your letter have existed with Nigeria and aggravated under your reign as President. Precisely, poverty, hunger and disease are cardinal components of the Millennium Development Goals, (MDGs), which you claim to be spearheading efforts in the guise of “Zero Hunger” initiative; but gave no attention to it when you wielded power at Aso Rock. This is the pretence and deception that have become your trademark and uprooted or alienated you from Nigerians. No one is surprised that you disparaged President Buhari’s efforts in curbing the monster of corruption and insurgency, which flourished under your administration and became untameable, with the reserved commendation by declaring that “it is not yet uhuru!” You display the lack of capacity to wholeheartedly appreciate the efforts of other leaders. President Buhari is leading Nigeria at its most tumultuous and tormenting era, with virtually all regions of the country embroiled in violent crises simultaneously. But he has significantly reduced the tempo of these conflicts and enthroned peace in most conflict areas. The herders/farmers conflict is unfortunate, but the President has not relented either. Apart from drafting security to the affected areas, Buhari has inaugurated an Economic Team headed by the Vice President, Professor Yemi Osinbajo to work out a permanent solution to the conflict based on its economic undertone. The claim to team work and collaborative efforts is spurious and porous. There is no such leadership content in you, exhibited throughout your years of leadership of Nigeria. Indeed, your close political associates often accuse you of resenting advice and it has earned you the epaulet of Mr.Know All. Furthermore, it belies the truth the postulation that the decision to denounce your party, the PDP to join the change train in 2015 was for altruistic reasons. The disagreement with former President Jonathan stemmed from his failure to seek your counsel and protect your strategic interests resulted in this decision and the shameful and un-statesmanly manner you reacted. This is a fact in public domain and it is faulty to claim otherwise. At every point, you are economical with the truth, by serving Nigerians with a menu of lies. Therefore, when you publicly declared that you have withdrawn yourself from partisan politics, it bemused many Nigerians. What else could be the colour and face of politics, when in your letter to Buhari, it expressed concern about the endorsement of President Buhari by some State Governors for a second term? What else is political, when you offer the unsolicited advice to President Buhari not to contest the presidency again in 2019? How else is politics played, when you incite public anger against a sitting President, by conjuring all manner of half-truths or outright falsehood against his administration? Nigeria was in recession, had an empty treasury, while public debts piled to frightening levels, most especially in salaries of public workers and local contractual debts, fraudulent oil subsidy claims and so forth. Meanwhile, crude oil price, the major national revenue source had dropped to as low as $28 per barrel. When ordinary, Nigerians expect an immediate impact of an economy which has just freed itself from recession, it’s understandable. But when someone like Obasanjo makes the same assumption and claim mismanagement of the economy, it is outright blackmail, and mischievous. It is this smart way of launching an alternative platform that you have condemned unreservedly the ruling APC and the opposition PDP. Thereafter, you proceeded to paint a picture of gloom and dark clouds in Nigeria reminiscent of the 1999 experience, which you could not make better, but shamelessly sermonized its baseless rebirth in the current dispensation. Chief Obasanjo, you must realize that there is absence of any solid legacy from you to remind any Nigerian of your status as a leader who once ruled Nigeria. So, enough of this bashing of every Nigerian leader. During your time, you performed abysmally, but Nigerians did not ask you to either resign nor not to re-contest. Contrary to your misguided belief, Nigerians are impressed with the ruling APC and the Buhari Presidency for what it has recorded so far. Nigerians know President Buhari is capable of offering more, if he continuous in office to 2023 with the support of Nigerians. Former President Obasanjo, you can keep your advice, but President Buhari is sure to coast to victory in 2019 to engender more development for Nigerians.